Convex acrylic mirrors in several sizes supplied in housing with adjustable mountable bracketry. Allows easy visibility in difficult store layouts as well as indoor & outdoor applications such as assisting visibility in blind corners. 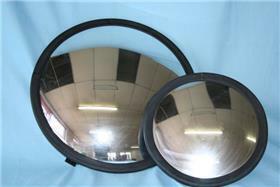 Diameters available 300, 450, 600 and 900 mm. Rectangular 300 x 450 also available.